We are always looking for ways to make life easier…especially with technology. 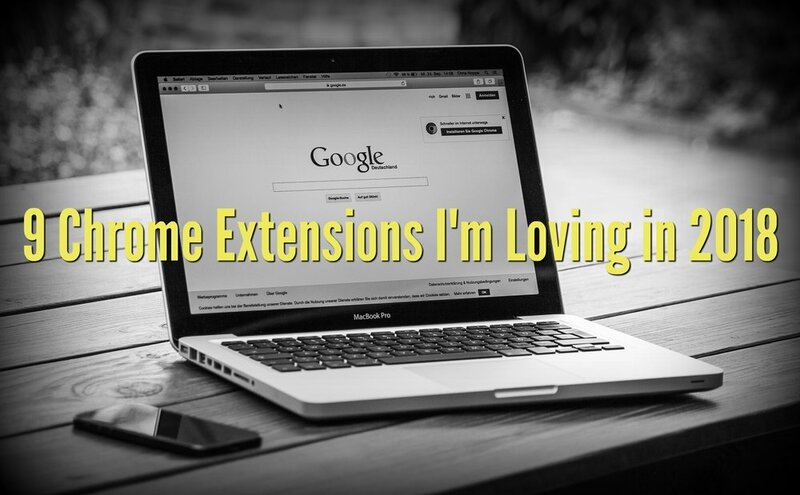 Chrome extensions are easy to install, generally free and make life so much more productive. Here are 9 Google Chrome Extensions I am absolutely loving in 2018. Boomerang offers email scheduling. While you may be thinking about an email right now, you may need to send it at a later time…this is where Boomerang steps in. You can write an email at 3:30 am, but have it sent at 9:30 am. No one remembers all of their passwords (especially not me), so LastPass is a true lifesaver. You only have to remember one password to keep all of your details in one hub. This will also help you keep your accounts secure because it generates a super secure password that will fill in automatically when needed. How many times have you been on a page and have filled out a ton of info only to accidentally press one bad key and end up on the previous webpage with all of the info gone? Backstop stops your backspace key from taking you to the previous page which can save you time and frustration. Let’s be real – everyone loves a good deal. With the Honey extension, you no longer have to search for coupons and codes endlessly. Just click the Honey button during checkout and Honey will automatically apply coupon codes to your shopping cart. MEGA is a secure cloud storage with 50 GB of free storage. The extension allows you to download MEGA into your browser and it will reduce loading times, improve download performance and tighten security. Grammarly ensures that all of your text is clear, has no mistakes and is impactful. Adding Grammarly means your spelling and grammar will be vetted on Facebook, Twitter, Emails, LinkedIn, and everywhere else you type on the internet. If you are working on a document, you can create and store these in the online editor. The Tab Wrangler extension will automatically close tabs after a certain amount of time has passed. This way you won’t have 100 tabs open that you aren’t using anymore. If a tab closes that you still need, don’t fret because all closed tabs are saved in Tab Wrangler’s vault so you can re-open them with a simple click. With this extension, you can grab an entire webpage with a single click and download it as a JPEG. You don’t need to have any special permissions to use it, just install the extension, click the icon in the browser and voila there is a full-page screen grab. Adblock Plus is the best-known ad-blocker for Chrome. All you have to do is point your browser at an ad-heavy site and the Adblock Plus icon will display a running count of all the things that are blocked. This can help you navigate through web pages more quickly and without having so many ad distractions come up.